This section contains swimming drills and exercises to learn to swim backstroke with ease. Have fun! Having good horizontal balance is required for backstroke. Learn The Flutter Kick In Backstroke: Knowing how to balance and do the flutter kick in a supine position (on the back) is an important prerequisite to learn the backstroke. This article teaches you this important technique. Learn To Swim Backstroke – Head-Lead Supine Balance Drill: This is an important drill to learn the backstroke, as it teaches how to be balanced and supported on the back using the lungs’ buoyancy. Being balanced means that the body is horizontal in the water while swimming the backstroke. Learn To Swim Backstroke – Head-Lead Side Balance Drills: These swimming drills are the next in the sequence to learn how to swim backstroke. Here you’ll learn how to float more on the sides rather than flat on the back and using a supple flutter kick. 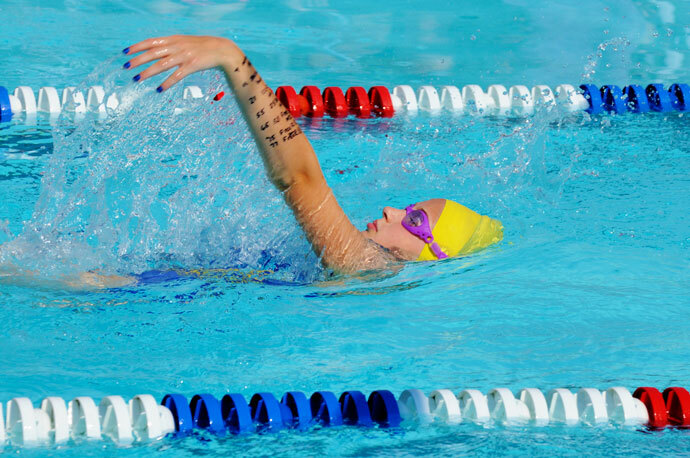 Backstroke Technique Drills – Learn The Arm Stroke On Dry Land: This article demonstrates how to do the arm movements in backstroke. Learning the arm movements is easier when you first rehearse them on dry land. Learn To Swim Backstroke – Hand-Lead Side Balance Drill: The next drill to learn to swim backstroke is a simple variation of the head-lead side balance drill. But instead of keeping both arms at your sides, you’ll extend one arm in front of you while keeping the other at your side. This teaches you how to keep balance while swimming on the side with an extended arm. Learning to Swim Backstroke – Under Water Arm Sweeps: The next swimming drill to learn to swim backstroke lets you practice your balance in combination with underwater arm sweeps for propulsion. Learning to Swim Backstroke – Single-Arm Backstroke: The next swimming drills let you practice the arm recovery above the water. However, to learn the arm movements correctly and to keep things simple, you’ll only practice one arm at a time. This lets you focus better on the arm movements and avoids synchronization issues between both arms. Learning to Swim Backstroke – Slide and Glide Drills: The Slide and Glide swimming drills are the last ones of our series to learn to swim backstroke. You will now practice simultaneous arm movements. I have been learning swimming for a week. But I can’t swim with backstroke technique even if it seems easier than freestyle. The biggest reason is I don’t know how to stand up again properly. I tried it in the very shallow pool. I could float but I couldn’t stand up easily, in other words, I sank while trying to come to the vertical position. Could you please suggest me the easiest and practical way for this? * I bring my arms to my sides underwater. * At the same time I curl up my body, which means I round my back, I bend my knees and bring them toward my chest. It’s as if I assume a crouching position in the water. This automatically moves me in a vertical position, then I just need to stretch my legs to stand up.